A fire destroyed a sports bar in Checotah on March 5. 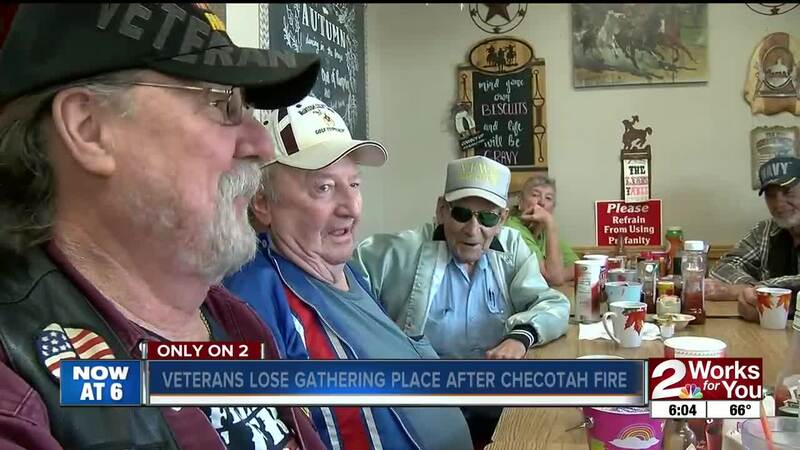 But the blaze took more than just four walls, it took the place where elderly veterans came for support. Just about every branch of the military is represented at one of the tables at Irene's Restaurant in Checotah. They discuss the day's news, their pasts, and here of late, how much they miss the place they used to gather until it burned. Peggy Marshall ran Monroe's Club west of town at America's Best Value Inn for 18 years. She came to work earlier this month and saw the fire coming at her just before it engulfed the building. Peggy lost a lot that day, but she is trying to hold on to her customers, like this bunch of veterans from her community. “I love these guys,” Peggy said. “They've been a part of my life for the last 18 years." These veterans swapped stories and shared a meal and played pool at Monroe’s, the only exercise most of them get – that they like anyway. But most of all, they're just there for their military brothers. "We all try to have their back and give them the support they need," veteran Ralph Mott said. Many of the veterans are still looking forward to birthdays. Peggy used to help them celebrate at Monroe's. J.D. is hoping it reopens soon. “They should hurry because every 10 years she gave me a birthday party and I've got one coming up," he said. After insurance is settled and decisions are made about what to do with the property, Peggy is hoping she can make some decision about reopening Monroe's Club. It keeps her busy and gives these veterans a reason to get up and keep moving.